Scientists are searching for reasons why the moose population has recently started to shrink. Someone tell them to check again next September when bettors have to suffer through last-second lateral scoop-and-scores. For those of you not familiar with the term “Moose,” it has been used for years within the sports betting world to reference a bad beat. It originated within the old-school gambling forums more than 15 years ago and has stuck ever since. Each Monday, I highlight the five biggest “mooses” from the weekend across all sports from my perspective (I can’t see everything). If you had the misfortune of betting on three of the five on the list, you will get inducted into “The Action Network Moose Hall of Fame,” get some gear, and potentially win cash if you signed up for our pro subscription. Let’s take a look at the five worst beats from this past weekend. A screenshot says it all for this game that ended with 149 total points. Super Bowl weekend could not have started off worse for those who bet on Siena +2.5 against Manhattan on Friday night. The Saints of Siena actually never trailed by more than two points until they fouled down 49-47 on a chaotic loose ball with 0.8 seconds left. I know those who got moosed don’t want to watch again, but for those that had no MAACtion action, you can watch how it played out in the clip below. I suffered through this one personally, as I backed the Bobcats at home -2 against Central Michigan. I sat in a bar streaming this on my phone and I regret every second. In fact, not only did Ohio jump out to a 10-0 lead to start the game, they never trailed in regulation. Additionally, they led by 10 with a little over three minutes remaining. 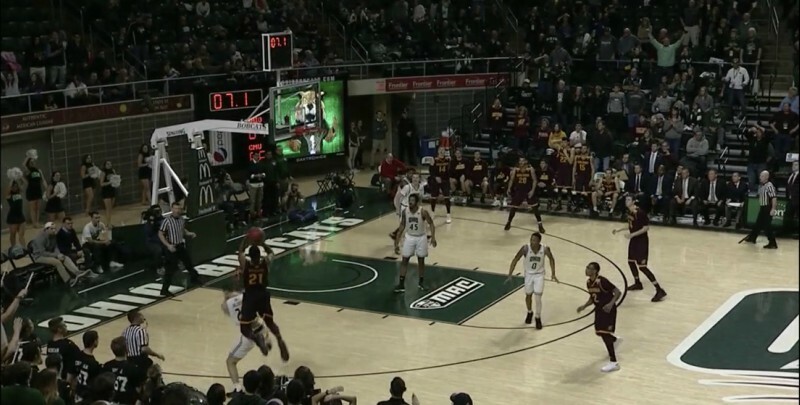 CMU would eventually force overtime thanks to 14-27 free throw shooting from Ohio in regulation. Not fun for Ohio backers, but they still had a really good chance at a cover. At this point, I chugged my drink a little harder, as I didn’t have a great feeling. However, Ohio recovered from the late collapse in regulation and seized the early momentum in overtime. The Bobcats led by five with 1:30 left, but CMU would eventually force another overtime by somehow banking in the 3-point shot pictured below. Double overtime. Ohio still has yet to trail in the game. Inevitably, Ohio lost in double overtime after fouling on a 3 with under a second left. I ordered a round of shots at that point… for myself. Under bettors may have potentially stopped following along after they saw Iona (an 11.5-point home favorite) holding a 67-60 lead with 50 seconds left. That would have been a major mistake. Quinnipiac outscored the Gaels 9-2 from that point on thanks to Iona missing all four of their free throw attempts in the final minute. Quinnipiac capped off the unlikely run with a game-tying 3 in the final seconds to force OT at 69 all. Only NICE if you had the over, as it actually gets worse. With only 138 total points scored heading into overtime, under bettors still had a legitimate shot at cashing. They still had 19 points to work with. However, like I said, this moose story gets worse. The game ultimately found its way into a second overtime tied at 79, which put the game over by a single point headed into double overtime. At that point, under bettors had no reason to watch anymore. I normally don’t cover fantasy, as I let the great guys at Fantasy Labs take care of that space. However, a fantasy beat takes the top spot in this weekend’s worst beats. How would you like to see your balance decrease from $1,000,000 to $2,000? Well, that happened to someone last night as a result of a stat correction. Jalen Mills had a tackle stripped from his official stats, which meant he lost the eight tackle bonus. That dropped the person in sole possession of first and the $1M prize. Hopefully, this helps you feel a little better about a miserable beat you suffered over the weekend.